Today I’m so excited to unveil something I’ve been working on since August. When I attended Food Blog Forum in Asheville, I had no clue all the cool people I’d meet and talk shop with. One of those people is Meghan from Cake ‘n’ Knife. We became friends right away and we realized we needed to plan a collaboration as soon as possible. We set aside time on our bus tour of Asheville to discuss ideas and take notes on our phones. We loved the idea of old-fashioned progressive dinner parties where people enjoy each course at a different person’s house. Meghan and I realized we’d met so many bloggers during the conference and asked, “Wouldn’t a virtual progressive dinner party of blogs just be awesome?” And an idea was born. So with Thanksgiving around the corner, Meghan and I would like to invite you to the inaugural Blogsgiving Dinner. Thanksgiving is all about family, friends and delicious food, and I really feel like I’ve found all of those things in the blogging community. This collaboration is all of that and more — my goal is also to make you drool and get excited for my favorite holiday. Here’s how it works: We have 20 blogs from all over the United States and Canada bringing one or more dishes to the party on Monday, Wednesday and Friday. 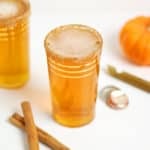 Each day has a theme, starting with appetizers, cocktails and soups today and winding down with dessert by the end of the week. Today’s full menu is below and I hope you’ll check out some of the amazing dishes created by my new blogging friends. 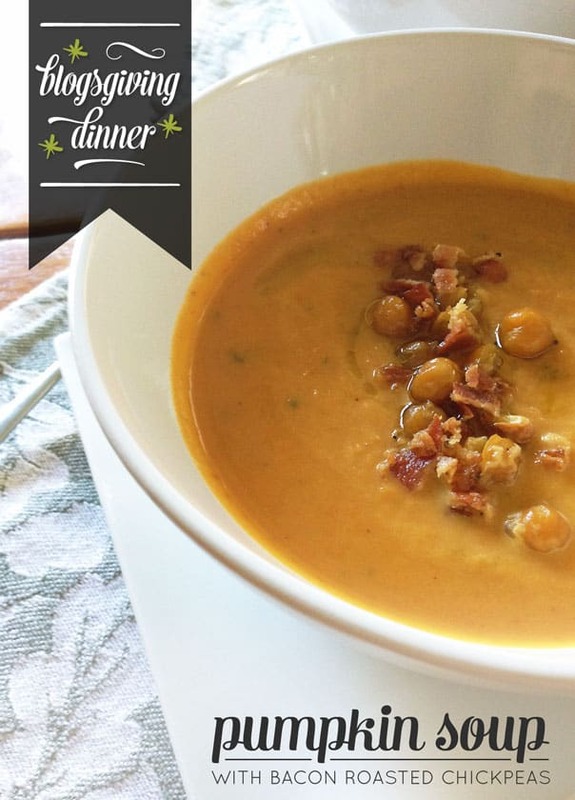 My contribution to today’s part of the meal is Pumpkin Soup with Bacon Roasted Chickpeas. 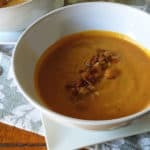 I’ve only recently come to enjoy pumpkin pie (don’t hate — it’s a texture thing) so a savory soup is wonderful way for people like me to enjoy pumpkin at Thanksgiving. My favorite part of this soup is the topping. The crunchy bacon crumbles and garlic-roasted chickpeas are simply divine — and you can make them ahead of time! 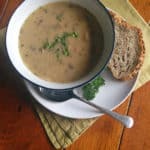 This soup is quick and simple to whip up, making it a great choice for Thanksgiving when you have lots of stuff happening in the kitchen at once. Anything that can save you time or a dish becomes a lifesaver. You can find that recipe after the jump. Anyway, I hope you’ll stop by some of these amazing blogs to see what they’re up to this week. And happy Blogsgiving to you! 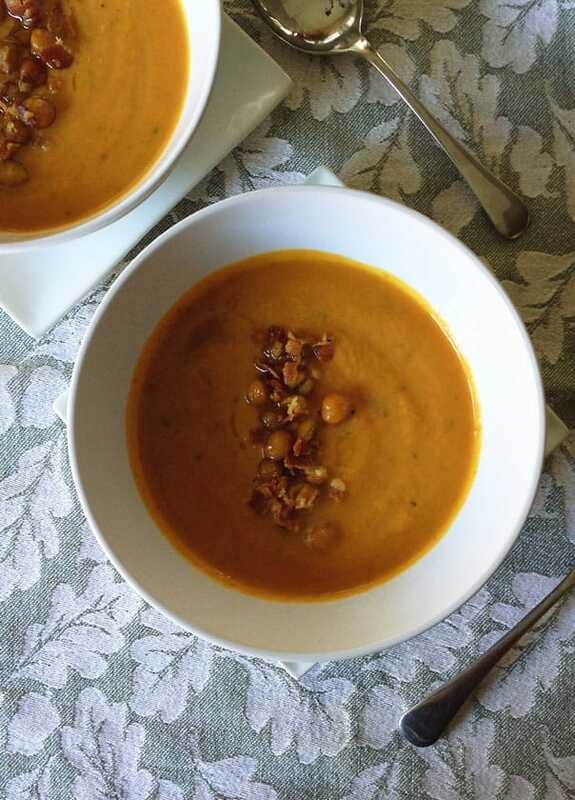 Pumpkin Soup with Bacon Roasted Chickpeas from Feast + West — see recipe below! 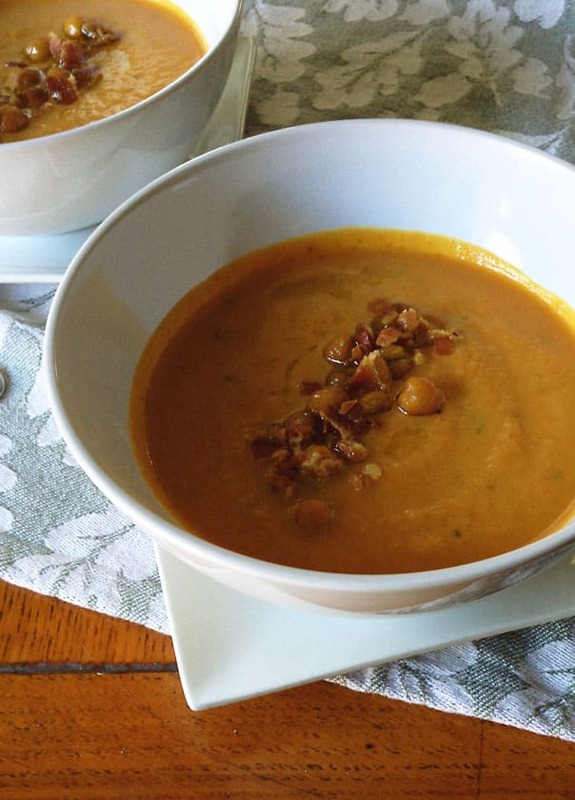 A savory soup is wonderful way for people to enjoy pumpkin at Thanksgiving. The crunchy bacon crumbles and garlic-roasted chickpeas are simply divine. Make the topping a day ahead of time. In a medium frying pan, cook bacon over medium high heat until crispy. Remove from heat and place bacon on a paper towel to cool and soak up any grease. Break into small pieces and set aside. Preheat oven to 350 degrees. Cover a baking sheet with foil. In a medium bowl, mix together chickpeas, garlic, 1 tablespoon olive oil and 1 teaspoon salt. Spread chickpeas onto the baking sheet in a single layer. Bake for 1 hour until crispy, stirring gently every 15 minutes. Remove from heat and allow to cool. 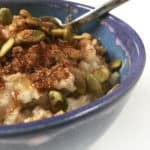 Combine bacon and chickpeas in a small bowl. Make the soup. In a large pot over high heat, stir together chicken broth, pumpkin, half-and-half, brown sugar, salt, pepper and tarragon. Bring to a simmer and reduce heat to medium-low, until ready to serve. Using the tip of a spoon, drizzle olive oil over top of the soup. Cover with around 10 bacon chickpeas. Store soup in an airtight container for up to 1 week. Oh sweet mercy! 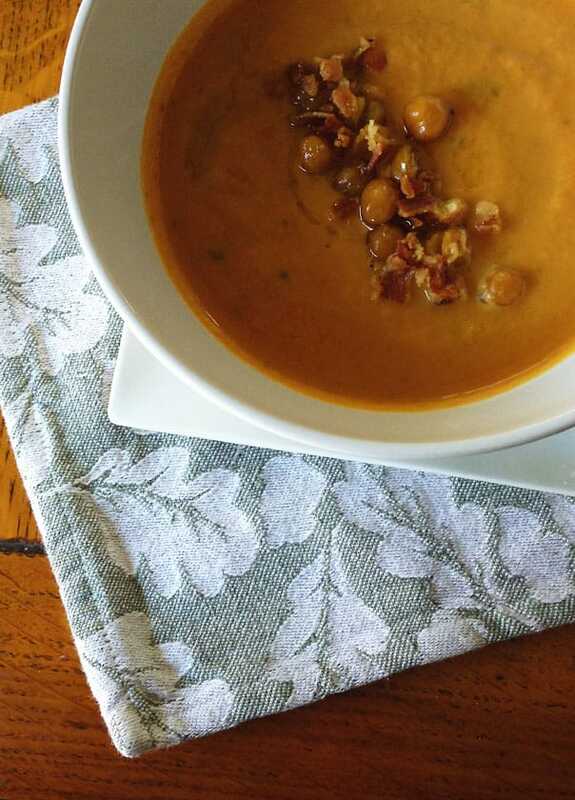 You pretty much put all my favorite things about fall into one gorgeous bowl of soup 🙂 I love the idea of bacon AND chickpeas as a garnish here. So tasty! Thanks so much for organizing this fun dinner! Oh yes, Amy. I’m so glad you love this idea. I hope you try it! The bacon with the chickpeas is really the most life-changing thing. It almost didn’t make it to the garnish! Thanks so much for your comment and for being a part of Blogsgiving Dinner. So delighted you are a part of it. Thank you so much for organizing this amazing collaboration! It is so much fun, and I am loving all of these recipes!! Your soup looks incredible. I would snack on those chickpeas all day long! Absolutely, Cate. I am so happy you could join us for it. The chickpeas are just an amazing snack on their own! Oh BFF, yes. You need to give soup a second chance, but this would be a great one to start with. It’s very easy and delicious to boot! This has been so fun but even more fun with you here with me! I’ve never had pumpkin soup, but my friend was just telling me that her grandma used their jack-o-lanterns to make soup after Halloween! Resourceful, right? Bacon and chickpeas make an amazing topping! Love that half the work gets done the day before, too. Anything that eases up the workload on Thanksgiving day is perfect. That sounds so cool, Jill! I’ve never used jack-o-lantern innards for anything except trash or maybe roasted pumpkin seeds! I am all about making things simpler for Thanksgiving. It leaves room for the more complicated or fun dishes! Thanks for your comment. Seriously! Bacon roasted chickpeas for everyone and every soup! It was such a pleasure to connect with you at FBF as well, Beth, and I hope we can collaborate again very soon! Oh my goodness, wow! This is a completely brilliant idea! My husband and I are hosting Thanksgiving AND Christmas this year, so we’ve got to come up with two separate menus, and I can already tell this is going to be a lifesaver. Thanks so much for putting this together! I’m so glad you’re a fan, Erika! I love making big events easier whenever I can! That is such a big job, but I am sure you will come out on top! Good luck with everything and thank you for your comment. This looks delicious! I love the idea of adding chickpeas for a little texture. Thank you so much for hosting this awesome event! What a yummy soup concept! I love the chickpea bacon bits on top. I was on a roasted chickpea kick a few years ago, and I had forgotten about that yummy snack until now – it’s perfect for this purpose, too. I bet the texture is perfect. Thanks so much for putting this event together. I’m having a blast. Happy Blogsgiving! Roasted chickpeas for a snack are just amazing. I need to make them more often for myself because they really are just so good. 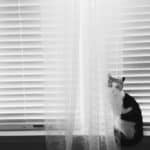 Thank you for being a part of Blogsgiving, Becca! I am so glad we connected at FBF.